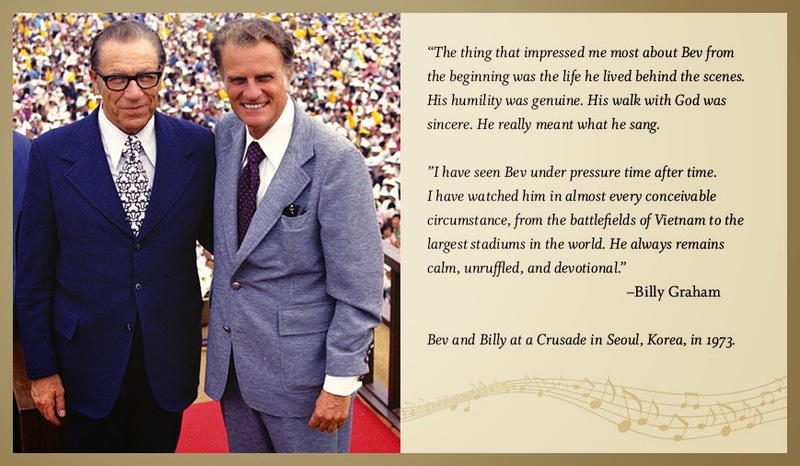 “HE HAS SUNG TO MORE PEOPLE THAN FRANK SINATRA,” exclaimed Billy Graham, as he introduced Bev Shea at a 1989 meeting in West Ham football stadium. “Please, Bill, never say that again about me!” protested the ever-modest Bev Shea, then eighty years of age. Indeed, even by that time America’s Beloved Gospel Singer had sung to more people, face to face, than any artist, secular or religious, in the whole history of music. 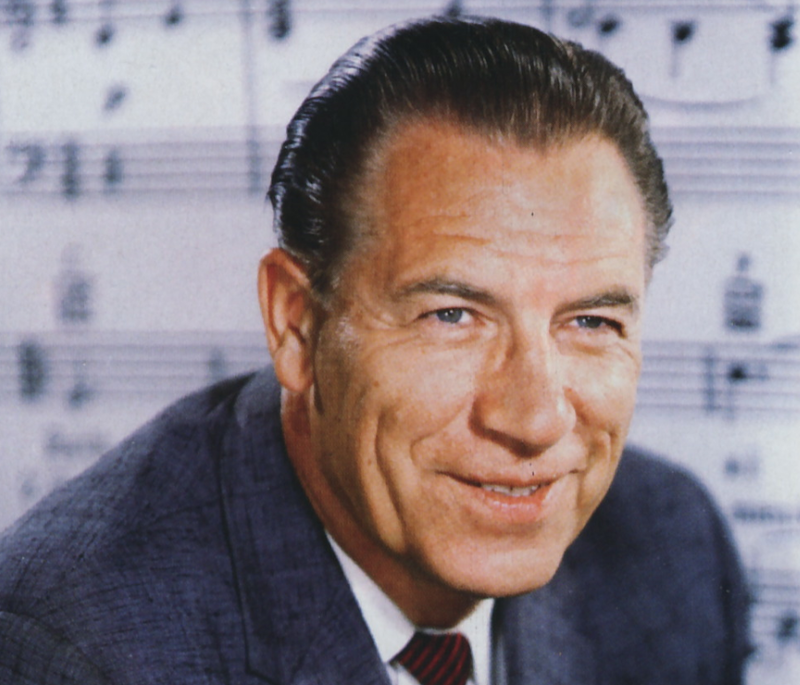 George Beverly Shea passed into the next life on April 16th, 2013, at the age of 104. We salute his memory, as we uphold his wife Karlene. It can perhaps be said of Karlene - whom Bev Shea married after the passing of his first wife – that she did as much as any to extend the ministry of this most remarkable Gospel singer of the twentieth century. Living high up at Montreat, North Carolina, close to the home of Billy Graham, Bev Shea – with Billy – would descend from the mountain with each fresh opportunity to take the Gospel message to some distant part of the world. There was considerable initial ignorance about the ‘Hot Gospellers.’ In Germany one journalist even invented a story about a Night Club in which ‘Beverley Shea, the young singing blonde,’ was found drunk! In Britain, after singing the solo It took a miracle to hang the world in space, a complaint was lodged about the arrogance of the singer who had claimed that ‘It took America to hang the world in space’! The three men - Billy Graham, Cliff Barrows and George Beverly Shea – were like film stars to us teenagers when they first hit London’s Harringay Arena in the Spring of 1954. Before long we knew - and were singing on the London Underground - not only Fanny Crosby’s hymns, Blessed Assurance and To God be the Glory, but Bev Shea’s solos, I’d rather have Jesus or Softly and Tenderly. It was ultimately to Bev Shea that the world owes the emergence from complete obscurity of Britain’s favourite hymn today, How Great Thou Art. He was walking down Oxford Street in London in 1954, when a long-time friend hailed him and passed him the hymn. Not a night went by, during the momentous sixteen week Crusade at Madison Square Garden in 1957, that Beverly Shea did not lead in its singing. From there it has gone world-wide. I couldn’t resist…. and settled down for a second breakfast. During it I remarked on the fact that Bev had sung to more people than anyone else in history. “Ah,” he replied – immediately turning the compliment aside – that’s only because of being with Billy!” And then he changed the subject. But he has always been this way. You would watch him delivering a solo in a great football stadium – and once the piece was over, he would turn immediately away from the podium and head back to his seat. No bows, no basking in adulation or applause; he would not have it. Nor was any Gospel meeting less than unique in his mind. When chairing ‘Mission ‘89’ in London, I can remember seeing him out of the corner of my eye, as enquirers poured forwards during Billy Graham’s final appeal. Bev was weeping. It still gets to him, after all these years, I thought wonderingly. 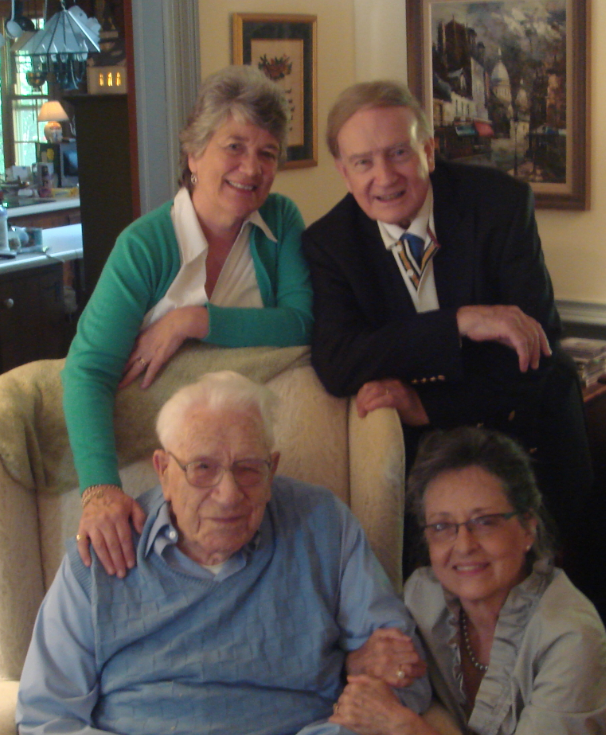 My wife Pam and I had the massive privilege of having tea with the Sheas in September 2012, at their home in Montreat. We prayed and read the Bible together. Bev even sang a little. Having recorded over seventy albums, and appearing frequently on television, Bev Shea had ten Grammy nominations in all, receiving the 2010 Honorary lifetime Grammy Award in February 2011, alongside such stars as Julie Andrews – and for which he received a standing ovation. It was when a Japanese man was once asking Bev Shea about the phenomenon of these successes and the great gatherings around the world, that the singer talked simply about “the wonder of it all.” Eventually the statement became the title of one of the most celebrated of all his songs. Bev Shea himself has been a wonder to us all. But he would have been the first to divert the statement heavenwards.